Last week we had our Annual General Meeting (AGM) & Annual Business Awards Ceremony. The Business Awards are all about celebrating the local businesses that provide great services to the area. 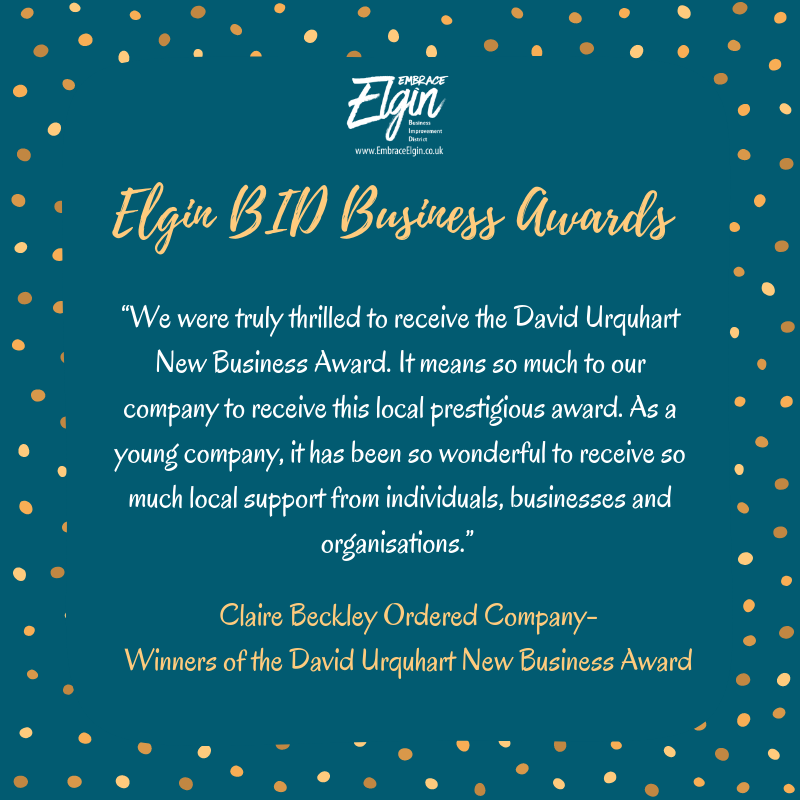 It really means a lot to the businesses to receive nominations in the awards as it shows them how much their customers and clients appreciate the work they do. The Business Awards were launched on the 14th September in partnership with the Northern Scot. In the first week we had over 200 votes. By the time the voting closed on the 10th October there had been thousands of votes cast for 199 businesses and individuals! We have to count each individual vote for all categories, which takes a while, but it is really heart-warming to see the volume of support for the local businesses. 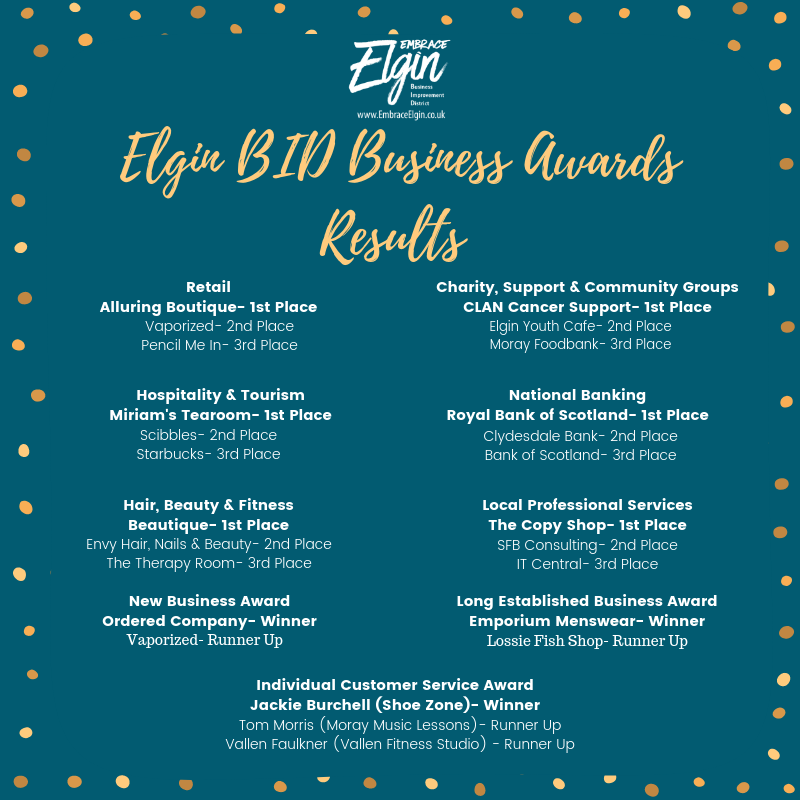 Our Awards are a little different from many other business awards as it is the public who nominate and vote for the businesses. 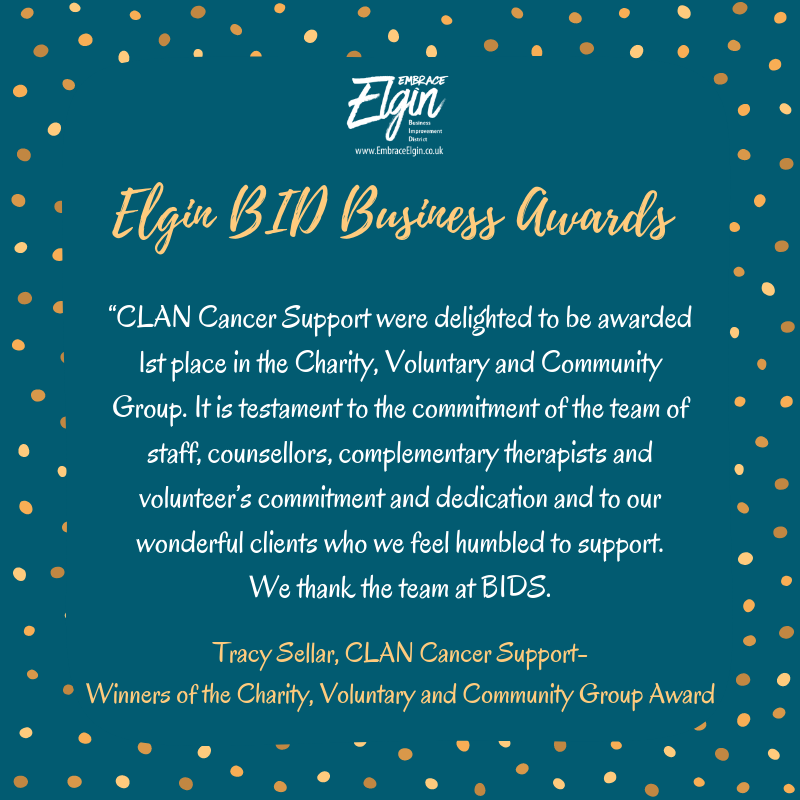 On the night, over 60 people attended the AGM and Awards Ceremony to hear about the work BID has been doing and our plans for 2019 in the AGM and of course to join in the celebrations for the Awards. Between the AGM and Awards Ceremony, we had a networking session where the businesses had a chance to have a chat with their business neighbours. Everyone also enjoyed a glass of wine (or two!) kindly donated by Gordon & MacPhail and delicious canapes that were prepared by the Moray College Catering students- the macarons were definitely the favourite of the night! One of the best parts about the awards is reading all of the wonderful nominations for the Individual customer service award. An independent panel of judges come in and they read through all of the nominations and they choose which nomination is the strongest and shows the best customer service. Tom Morris from Moray Music Lessons and Vallen Faulkner from Vallen Fitness Studio were this year’s runners up. It’s great to see people taking time out of their day to nominate someone that really made a difference to their day. We received dozens of nominations this year, here are some of the comments. 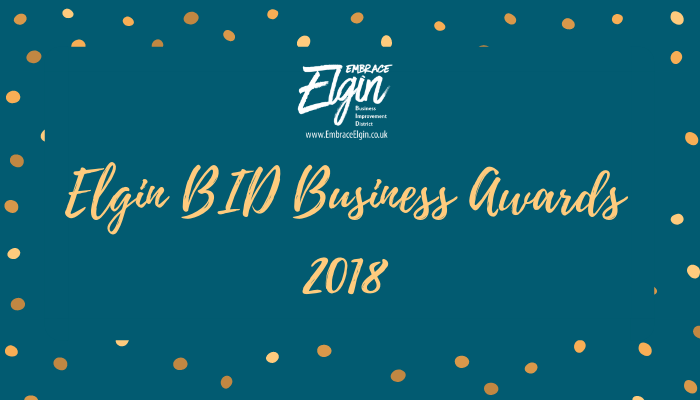 The Business Awards are one of our favourite times of the year because it is truly wonderful to see that we are still getting thousands of votes in every year. This shows how much the local people really care about the local businesses and want to show them how much they appreciate them. The Awards will be back next year so be sure to vote and if you have received customer service that has really made you feel special or you feel is of exceptional standard write it down for next year’s awards!